1011-1019 IRMA Roof Drain Applications - Jay R. Smith MFG Co.
Used in roof systems where the insulated membrane assembly method of waterproofing is provided. It is used where built-up felt and asphalt waterproofing is installed. A 4"(100) high perforated stainless steel gravel stop is supplied to retain the crushed gravel used in IRMA flat roof construction. 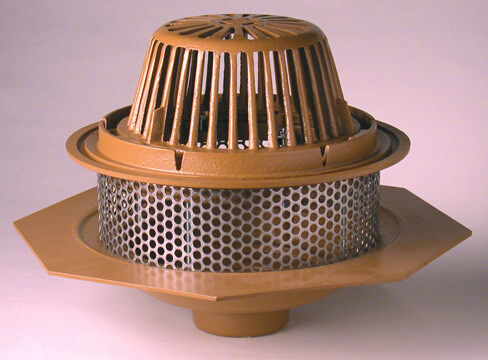 Smith 1017 cast iron body with combined flashing clamp and gravel stop, polyethylene dome and perforated stainless steel extension with secondary flashing clamp, for use on roof systems where built-up felt and asphalt waterproofing is installed. See manufacturer’s catalog for recommended deck opening. Smith 1018 wide flange cast iron body with combined flashing clamp and gravel stop, polyethylene dome and perforated stainless steel extension. For use on roof systems where waterproof/liquid membrane deck covering is used. See manufacturer’s catalog for recommended deck opening.